The United States Supreme Court affirmed the invalidity of four computer-implemented financial services patents in Alice Corporation v. CLS Bank International. The unanimous opinion sets forth a framework for analyzing financial services (and other) patents going forward. On its face it is appears somewhat anti-patent. However, past cases in this area have actually proven to provide guidance that is ultimately helpful to parties seeking to patent their financial innovations, despite initially appearing to create barriers to patenting such innovations. The Court determined that the claims are directed to “the abstract idea of intermediated settlement.” Because abstract ideas are ineligible for patent protection, this first step placed the invention, at least initially, in the not-patent-eligible category. The Court then checked whether the claims added other features such that the claims as a whole were nevertheless directed to more than just the idea of intermediated settlement. However, the claims include nothing more than generic recitations of standard computer hardware and well-known computing process. Therefore, the Court struck down all of the claims of the patents. 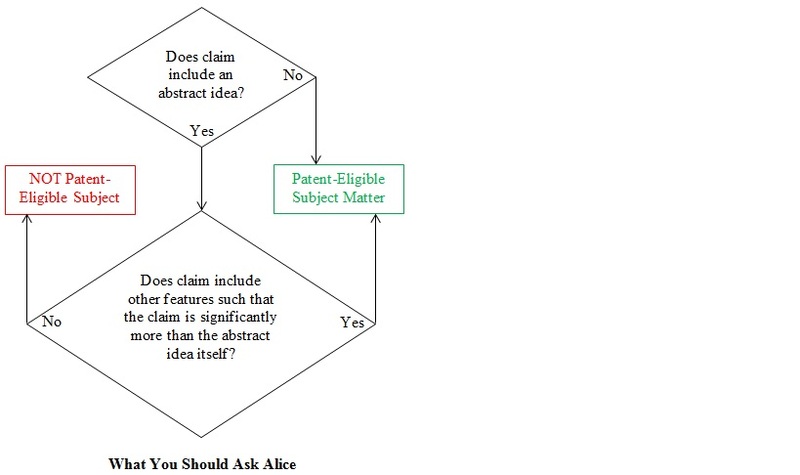 The Patent Office has already issued Preliminary Guidelines to its Examiners on how to apply the Alice case. The Guidelines identify fundamental economic practices, methods of organizing human activities, and mathematical formulas as examples of abstract ideas. In looking for something “significantly more” than the abstract idea the Patent Office instructs its Examiners to consider whether the invention improves another technology or field, whether the invention improves the functioning of the computer itself, and whether the claims go beyond linking the use of an abstract idea to a particular technology. The Guidelines note that simply requiring no more than a generic computer to perform generic computer functions will not be sufficient to be significantly more than the abstract idea. On their face, the Guidelines do not seem significantly different from what is being currently applied by the Patent Office. To improve the chances of a patent surviving judicial review, it will be important to provide substantial description in the patent of the particular benefits achieved by the invention, with emphasis on pointing out improved efficiencies and continued detailed description of the hardware involved in implementing the invention. Courts and the Patent Office are likely to continue to struggle with how to distinguish an “abstract idea” from patentable idea. However, this case provides some additional help for drafting new patent applications and analyzing existing patents.